I have done a bit of calligraphy over the decades and I live in the rural West of [Ireland]. 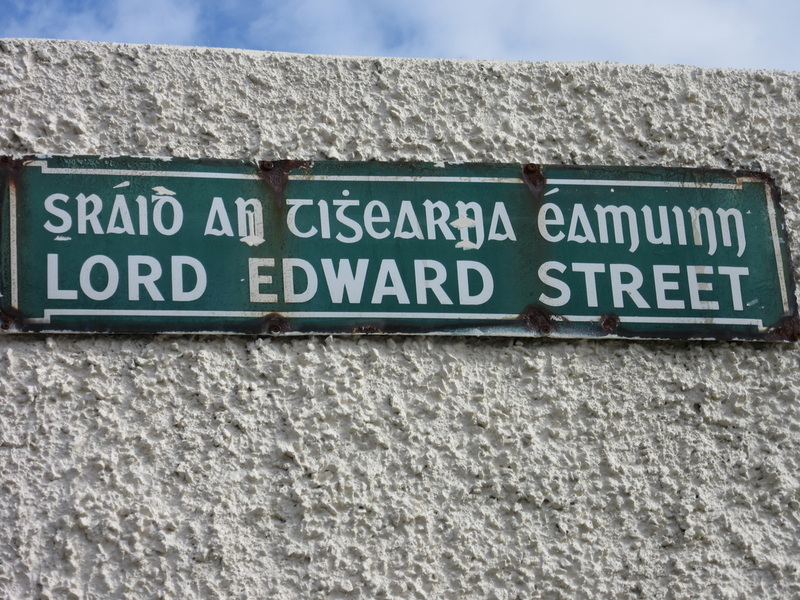 So I notice that the street signs and a lot of the art and all of the old Irish writing is in what my teachers in the Donegal course simply called “the old way they were taught to write Irish in school fifty years ago”. Well, if it was taught in school, there must be some sort of book or practice material or mimeographed handouts. […] The teachers suggested I try Google, which was fruitless. I’ve contacted an Irish calligraphy society, who put me in touch with a man who suggested I copy Irish-language fonts. But the fonts are all different from the old writing I see in old documents. Could you put the call out to your friends and colleagues who might have information about how to actually form the letters and letter combinations (literally how to move the pen to make the strokes, like they teach five-year-olds to write individual letters in English with a pencil)? Even legible page scans are OK; I need only the information, not the actual book if it’s not convenient for the person to send it to me or make copies of it. I once came across an Irish grammar on google books with a plate showing the hand-written forms of the letters. Sorry I can’t provide more details now, but will do a search to see if I can find it again. PS I just did a quick search and found some examples of ‘Ancient Irish alphabets’ from 6th to 17th century in John O’Donovan’s 1845 “A Grammar of the Irish Language”. This is not the book that I originally had in mind, but it may be something along the lines of what you were looking for. The O’Donovan book is online, and the Ancient Irish alphabets are just before the table of contents. I don’t think it’s exactly what speedwell had in mind, but it may help; thanks! Those all look very nice; I hope they’re what speedwell had in mind! On a related note, some of the school copybooks collected by the Irish Folklore Commission are in Irish and scanned online. From Inisheer in the Aran Islands, here’s Máire Ní Chonghaile’s 1937 transcription of a story told her father Tomás Ó Conghaile; other stories in the same volume were transcribed by her classmates, with varying penmanship. I’m actually quite curious to learn what type of writing this is! I assume “the old way they were taught to write Irish in school fifty years ago” wasn’t half-uncial (unless “fifty” is a typo for “a thousand and fifty”), but maybe not? I tried googling but all the street signs I found were printed, and “handwritten Irish sign” or similar just gets you a million Pinterest-ready variations on that thing about the road rising to meet your feet etc. D-AW, yeah, I’ve been finding lots of “write Celtic calligraphy” which is just uncial and some knotwork design. This is a specific alphabet designed specifically for the Irish language. I can draw a typeface, but I’m looking for the way people actually used to write (and yes, it was fifty years ago when they changed to using English letters). I’ve just emailed Michael Everson about this. Though not as good as an abecedary, it shows the relationship between Gaelic handwriting and Gaelic (uncial) print. Thanks for the update, badgersdaughter! I should have mentioned that speedwell goes by badgersdaughter these days. That text in Latin orthography is error-ridden and is not identical to the script in the linked video. ac saor sinn ó olc. trí shaoghal na saoghal. Ámén. I’m not sure this unicode transcription will work so this is just as an experiment. trí ṡaoġal na saoġal. Ámén. I used to have Irish fonts on my old M$ window$ system but I haven’t yet looked for linux compatible fonts. The Irish fonts looked beautiful when printed. The handwriting in the video matches several samples I have seen on a relative’s old books (The Love Songs of Connacht, An t-Oileánach). Works well on my end. I think dotless i (ı) is traditionally used alongside the dotted aspirates. That’s not an ı as such; it’s simply that in Gaelic fonts, i has no dot. Of course the script is not the same in different time periods. Your omniglot link, for example, relates to the Old Irish period, when there were no dots over consonants to indicate lenition. The script in the youtube link is the traditional one for Modern Irish, with the distinctive (and hard to distinguish) lowercase r and s. This is the script used in Dineen’s dictionary, which is still widely available in bookshops in Ireland. And the Sligo street sign (and all similar signage and public notices) is in a later, slightly simplified variant of this which was taught in schools into the 1960s and in which the uppercase forms of r and s replaced the traditional lowercase forms. Older Irish people will have learned to write in this way but I imagine they were taught from the blackboard rather than out a book. I feel I should have been here earlier. If speedwell the badger’s daughter wants to get in touch with me, I can give advice; & locate my insular minuscule exemplars. If this http://catanea-blog.tumblr.com/image/505653347 is the sort of thing wanted–slightly more cursive I’d imagine. Speedwell the badger’s daughter, if you want to learn, ask Mr Hat for my e-mail (I am unsure on the etiquette of this). MM: Huh, the request reminded me of the same collection (I did not comment because I thought it too irrelevant), so I assumed I knew it via LH or LL, but cannot find it mentioned on either. What a small internets, I guess. Celtic Art: The Methods of Construction by George Bain, while mostly about knotwork, has a fair amount of information and examples of calligraphy.